What You’ve Heard About Kennesaw…It’s TRUE! Kennesaw is a suburb of Atlanta located in North Cobb County approximately 25 miles outside of the city and it home to nearly 30,000 residents, according to the 2010 census report. The city of Kennesaw covers about 9.5 square miles. Just outside the city limits sits Kennesaw Mountain National Battlefield Park, the highest peak within the metro Atlanta area at 1808 feet above sea level. Kennesaw has a long, rich history as a railroad town and a Civil War training camp and battleground. Today, Kennesaw is a progressive suburb greatly impacted by the proximity of Kennesaw State University as well as the North Georgia Mountains. The downtown corridor has changed greatly over the last 2 decades with the addition of new condos, apartments, restaurants & shopping. While the more “colorful” shops remain, new upscale stores are on the rise. Residents also enjoy the amenities available at nearby Lake Acworth as well as the Town Center area. If you are looking for confirmation of the more controversial facts, click here. 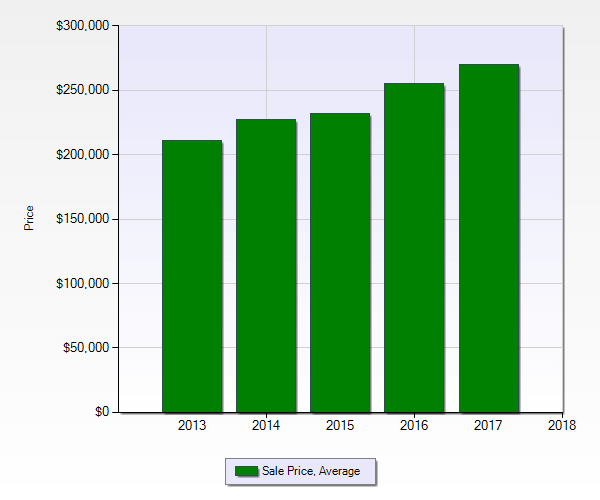 Based on the information acquired from First MLS for Kennesaw over the last 5 years, ending in December 2017, on 7,7473 SOLD RESIDENTIAL UNITS (included single family residences, condos & townhomes), the average home price in 2017 was $269.780 showing an increase year over year.